For delicious crops of crisp and juicy berries from July through to September. Great for container growing in ericaceouse (acidic) compost, blueberries provide attractive spring flowers, delicious and highly nutritious summer fruits, and decorative autumn foliage. All varieties will reach to 1.8m (6ft), but usually less when grown in containers. Easy to pick with a crisp and sweet flavour, Draper is an early fruiting variety, a heavy cropper with large berries and an excellent colour, cropping from July. This excellent mid season variety is perfect for a smaller garden or a large pot on the patio and produces rich flavoured fruit in abundance in August. Considered the best all around variety for consistent yields with large, high quality fruit, and disease resistance. This popular variety can be planted either by itself or in a collection of varieties to aid cross pollination. Bluecrop is an upright, open growing bush to 4-6 feet. 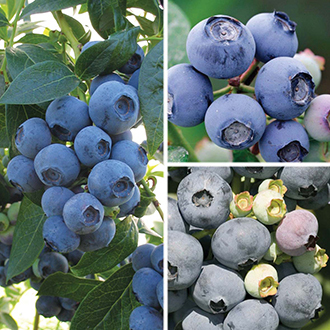 Extremely high yielding, the dark blue, richly flavoured berries fruit in profusion from the end of August through into September and, last well once picked. 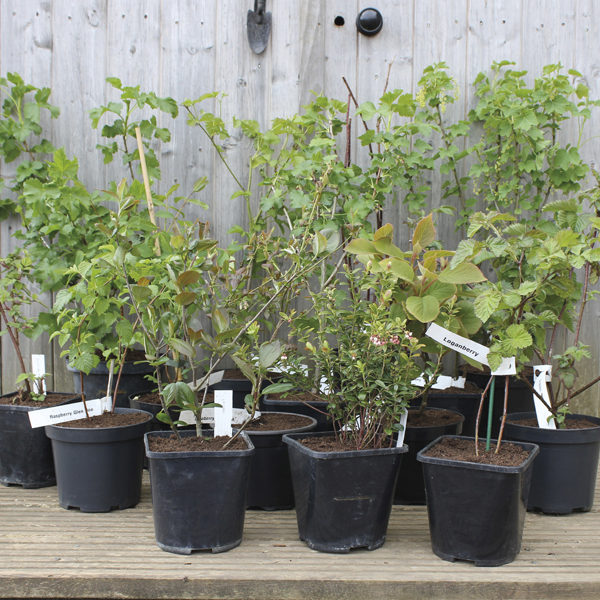 All supplied as well-developed plants in 2 litre pots. Buy this collection & SAVE £15!